PIERCE COUNTY, Wash. – While snow may be causing a headache for many people in Washington State, it helped police track down an alleged burglar in Pierce County. Early Monday morning, a woman called 911 and said someone was trying to break into her home near Spanaway. As deputies were en route to the location, the woman told dispatchers the suspect made his way into her bedroom and ran away when she yelled at him to get out. The Pierce County Sheriff’s Office said the suspect was gone by the time deputies arrived. 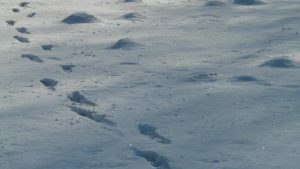 However, the man left a long trail of fresh footprints in 12 inches of snow. Armed with a description of the suspect, deputies followed the prints—and the trail of discarded property belonging to the burglary victim. Eventually, the 1.9-mile trail ended at a tarp-covered vehicle. The deputies—rightly assuming the suspect was hiding under the tarp—told him to come out. After they didn’t receive a response, deputies tore off the tarp and found a man in the back seat. He refused to get out, so deputies had to pull him out of an open window. The suspect, who refused to identify himself, was found with a small knife, a flashlight, three garage door openers, and the victim’s wallet. He was booked into the Pierce County Jail for burglary, prowling and resisting arrest.